Crafted with an outstanding attention to detail, the Falcon V6 Speedbag delivers efficient and organized storage for your fishing tackle. Made to accommodate four 3700-size Stowaways, the Falcon V6 Speedbag features a cavernous YKK Zippered main compartment and an additional zippered pouch on the underside of the top flap. 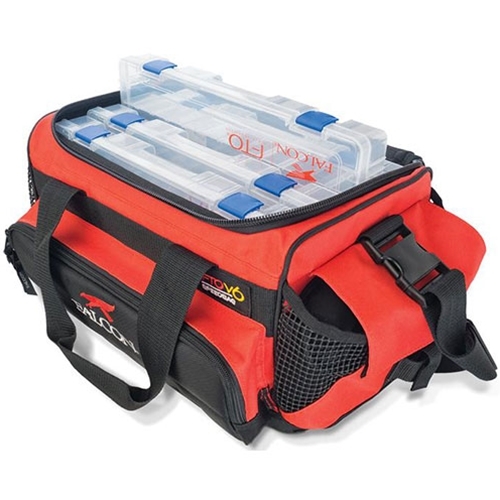 Along the front, the Falcon V6 Speedbag is fitted with a zippered compartment that comes equipped with a Velcro divider, so you can keep your soft plastic and accessories separated. On either side, the Flacon V6 Speedbag boasts velcro'd stash pockets that are perfect for spools of line and larger items with storage, the Flacon V6 Speedbag offers a large rubber mesh stash pocket along the back.